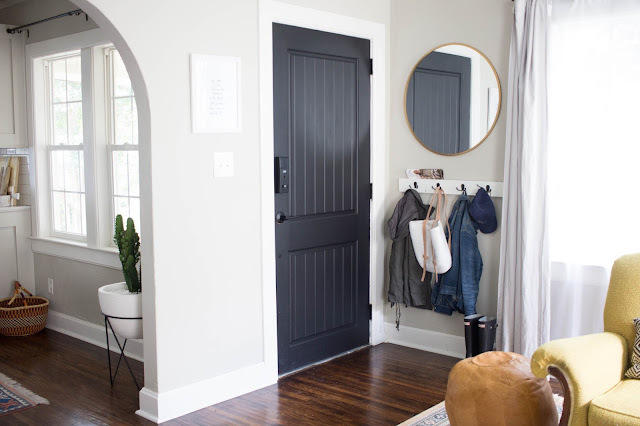 I've always wanted to decorate an entryway (like this one or this one) but in our home, the front door opens right in to the living room leaving no space for a bench or table. For the longest time we had just a few hooks that we just picked up from Target and it was just okay, nothing too special. But when I saw the inspiration photo below from Annabode + Co, I just had to try it in our space. I feel like the mirror made the space seem bigger and the whole room looks more balanced and styled. 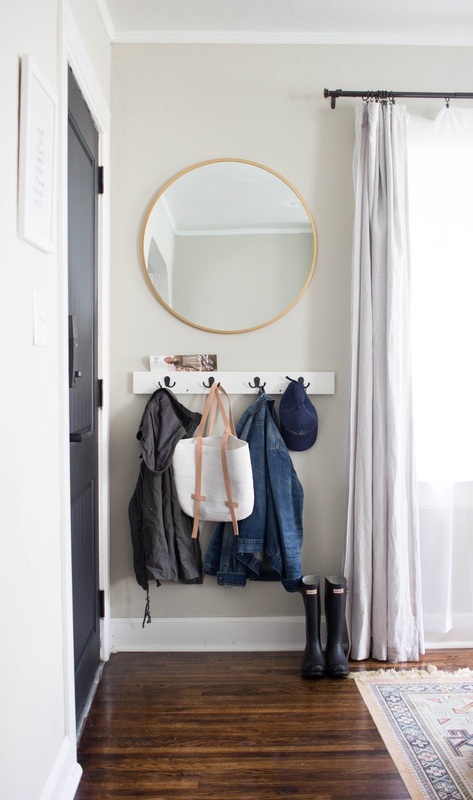 I'm so glad an entryway is possible in small spaces! Now I just need to add built-ins on the opposite side of the room and this room will be complete. 1. Define your goal for the space. 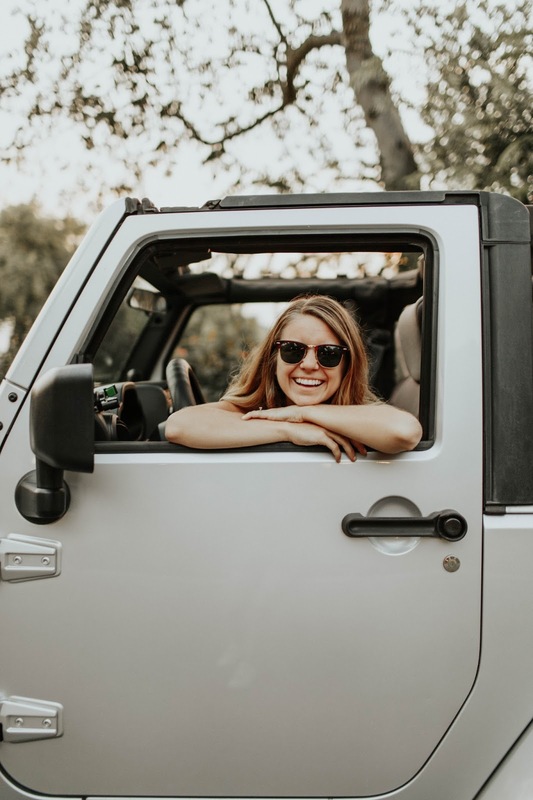 Do you want it purely decorative or functional? Maybe a little bit of both? I wanted our space to be welcoming, hold our coats, function as a mail drop and still be something nice to look at. I scored this mirror at Target for $12 and have had it in the box for months since I didn't know where to put it yet. I also repurposed the hooks from our previous coat rack to save money. You may just have what you need around your home! Shop your house before going out and buying new. Spaces like this are small and don't need much anyways. I searched Pinterest for entryway inspiration but all these large spaces kept coming up. 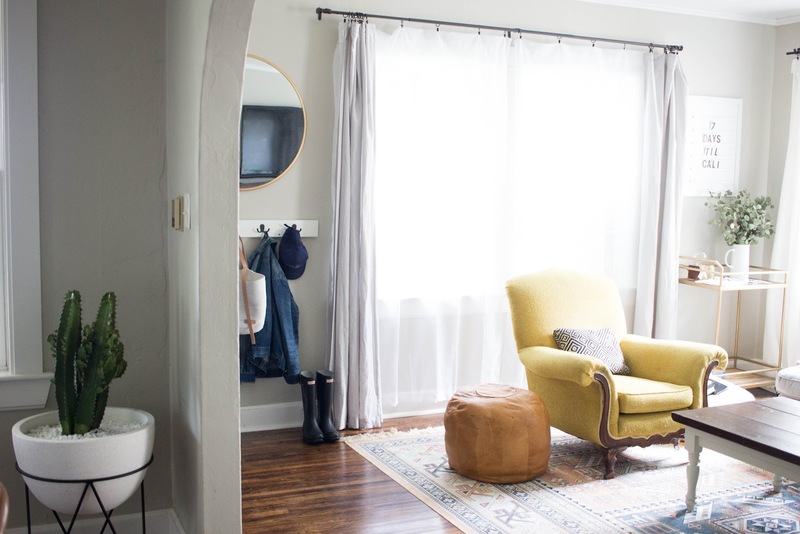 When you search, look at small spaces home tours and see how they decorated near the front door. Most of the time you have to dig deeper to find a unique space. I was nervous the space may end up cramped or look cluttered. It definitely was simple before but not styled well. Now, with a few tweaks it is still simple but now it is styled and looks intentional with the space. If one of your goals from #1 was to create function, think of how you can use decor to double the function. 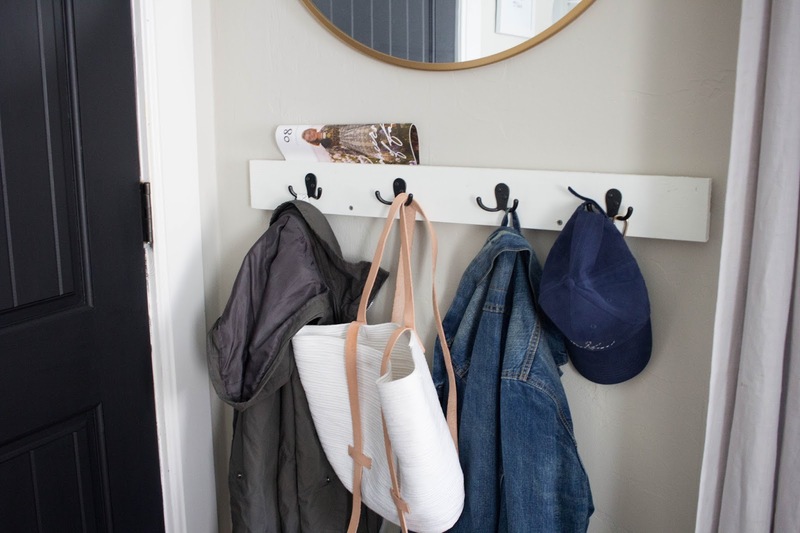 I created the coat rack to also be a mail organizer and hold coats and bags we like to keep out. This way, one piece goes a long way! I love a good before & after, even with slight changes! 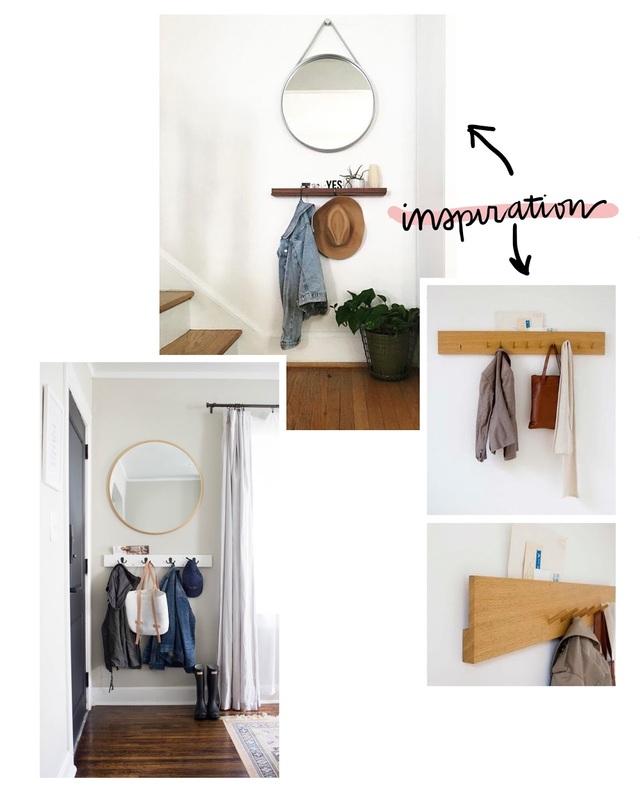 I love finding inspiration on Pinterest and it is even better when it comes to life in our own way in our home. That's what Pinterest is for anyways, right?! Thanks Annabode + Co for the inspiration. 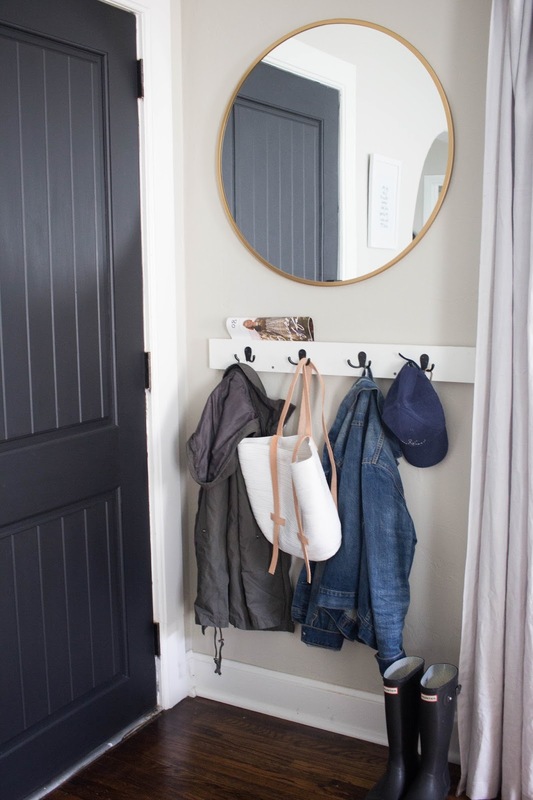 I'll be back later this week with a tutorial on how to make the mail organizer coat rack (hint: it is sooo simple). Thanks Manda! I am learning more and more I don't like clutter so this really helps. I can see how it is hard with three boys! Love this! 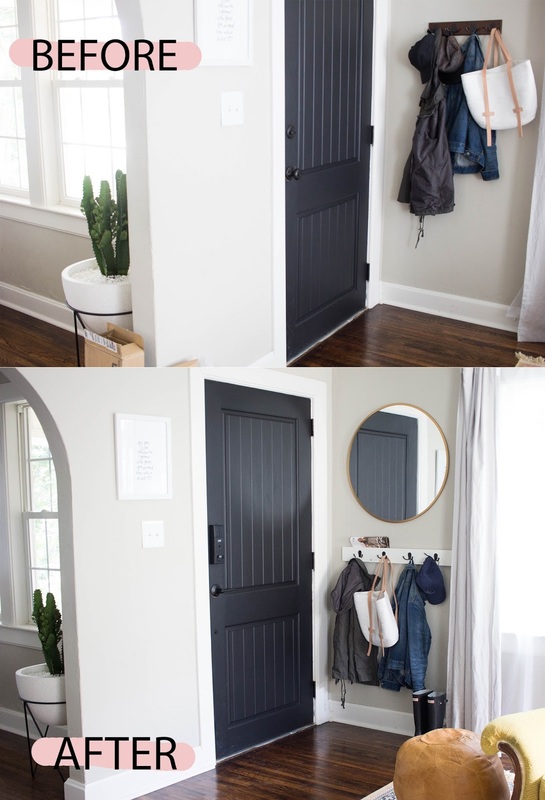 I just moved into a teeny apartment (from one that had an entryway) and will definitely be doing this. Where did you find that mirror? I'm having such a hard time finding one with a low profile like that one. I found it at Target for a steal! Wow this IS a tiny space! You rocked the makeover though, it looks infinitely better with just those simple changes! 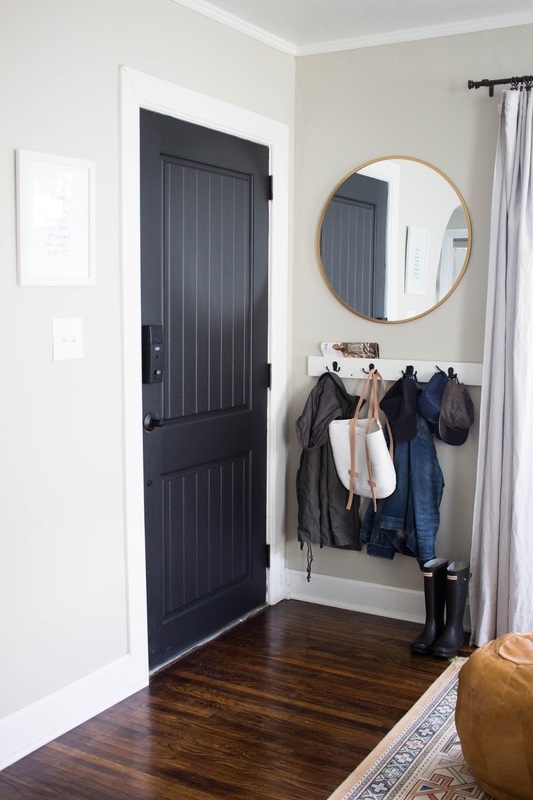 This is just the inspiration I needed for our teeny tiny entryway! Quick question, what color paint are your walls, it's gorgeous! I'm so glad, Heather! Our walls are Revere Pewter by Benjamin Moore! Does your door ever swing back to far or do you have issues with opening it with the stuff behind it ? We haven't had that issue! We don't keep too much stuff there usually! Where is that rug from??? It is from RugsUSA - there is a link under "shop my home"